I suffered a Traumatic Brain Injury (TBI) from a fly ball at a men’s baseball game while playing tennis nearby years before, and was getting treated at a prestigious hospital to fix damage in my occipital cortex (the area of the brain that processes what the eyes see into images that make sense) in an attempt to bring back sight and balance. In this January surgery, the doctors made a mistake and drilled about 6 inches above the designated drill point. We believe this knicked a nerve that controls feeling and motor waist down; it additionally put my brain into shock, adding to the damage from the original TBI. A year ago today, I rolled off the surgery table unable to feel or move anything waist down. That day the doctors dismissed me of their care feeling it pointless to bother with physical therapy and sent me home with no other option than life in a state disability home. But this is not a story of pain, nor injury, nor heartache. It is the story of life, recovery, and hope. June of 2012 was the first, but not the last time I went fully blind, seeing only blackness and a cloud of panic at the words, “The lights are already on.” My TBI caused the nerves in my occipital cortex to stop functioning and I was temporarily blind. Disbelief can be a purposeful dance of emotions and inner choice. That day and every day after, I refused to believe medical predictions. 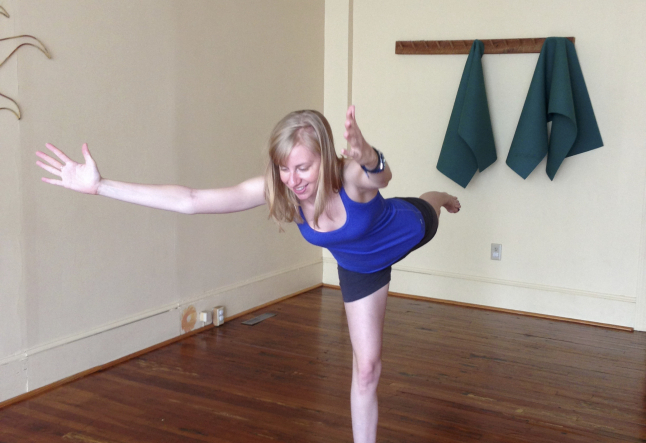 In October 2012, after 6 months bedrest and one surgery, I brought myself back to my yoga mat. That first class back, I was unable to stand in mountain pose, and lay in Savasana with tears soaking my cheeks. My yoga teacher that day became an advocate of hope. Annie’s sincere enthusiasm of my simple presence at class brought me back again and again until I eventually began to walk with some small balance. That January day of my second surgery, Annie was at my house within a half hour of my return and brought with her a yoga army. A yoga army is like none other. My studio divided and conquered; three times a day, someone different came to my house. Some I knew, some strangers. I left my door unlocked so anyone could come in and crossed my fingers only safe people would find my door. They came with open arms and open hearts. Open to help me towards any life that was meant for me, open to grasping towards all hope possible, and open to loving someone incapable of giving anything back. They came to me in my darkest hours and brought me back to life. In between their visits I did two things. I read yoga and anatomy books and decided what poses I would have my next visitor put me in. And I worked on arm strength. Alone, I dropped to the ground from the couch, and propelled my body around with no movement from legs, but determination in my arms. And I suffered seizures, periodically waking in odd places, feeling a familiar buzzing in my brain, and wondering about my future. This began my next round of unconventional, totally guessing at it, yoga therapy. Save my life it did, but it took from me my personality, hope, and happiness. 100 stitches and a few patches of bald scalp later, my surgeries were for now, done. With eventual clearance to do a little physical activity, I brought myself back to the mat, cheered on by kind friends, yogis, and strangers, as I was helped through the studio doors that first day back in June 2013. I restarted my daily yoga, and eventually found myself again, somewhere between the mat and my heart. I found most of the feeling in my body again, although still struggle with weak awareness in my hips. I practiced in front of a mirror to compensate for what I could not feel by seeing and touching with my hands. I practiced when I felt good, and I practiced when I had no hope. I practiced in the evening when I had lost all my energy by simply trying to remember friends’ names during the day. And I practiced in the morning when seizures and fear had kept me up all night. I practiced through my first warrior 3, conquered 2 months after surgery. I practiced through my 200 hour yoga teacher training, I practiced through a major move, and I practiced as I tried to figure out my new normal, and why exactly I had been put through this trial. And I practiced on an ordinary day before speaking with another angel who was ready to change my life, on January 8, 2014. Time for my next step: my 500 hour yoga teacher training in preparation to become a yoga therapist. I am now almost 9 months out from my last surgery, and am able to walk and balance better than most athletes. It is not a miracle and it is a miracle all in the same breath. I walk because of yoga. I balance because of yoga. I found myself again because of yoga. I stand, physically and spiritually because of yoga. Blood, sweat, and a flood of tears brought me to today. But so did yoga. And so did many angels along the way. Over the course of my journey I have become certain that nothing- even a fly ball- is coincidental. I refuse to believe that one accidental fly ball could so drastically change the course of my life without a specific and better plan ahead than what I once hoped. This certainty is not one that came easily, but one that slowly and steadily found a path to move great sadness towards hope, thanks to many along my path. This certainty came not from the physical practice of yoga, but the spiritual practice of yoga. Today, exactly a year to the day after the surgery that temporarily paralyzed me, I start my journey off fresh, beginning my training to become a yoga therapist, and ready to work with others in their darkest (and brightest) moments. “We have to let go of the life we imagined to have the life that is waiting for us.” Joseph Campbell. In an other article from Christine Dance, you can read about yoga in the non-physical practice.